Dominican republic is wonderful as well in low season! We recomend you to take advantage of special hotel offers during the summer and autumn. We have launched a new website for our customers. Replaced the old, already inadequate pages. We believe that the new presentation, you will serve well. Santo Domingo – you will visit the first Cathedral of America, D. Colombo´s house and other fascinating historical places of the capital. We thank to all of you that bought our calendary and CD, which we sold for charity reasons. Detailed information. Hotels are devided by location. All inclusive programme is offered in each of them. Apart from food and drinks, sports and entertainment programmes are included. We offer you a large variety of wonderfull excursions from Juan Dolio and Punta Cana. If interested in history, locals´ life, nature, National Parks, leisure on virgin beaches… with the assistance of our representative you will discover all this. We offer the best prices for German and other International flights. Purely a tourist area on the east coast along the beach Bavaro, which is unquestionably one of the world's finest beaches. Its 35 mile length is an infinite strip of white fine sand, palms and turquoise sea. Hotel complexes in Punta Cane are famous. Due to strict rules (eg, buildings shall not exceed the surrounding trees), the complexes are spacious and gives a peaceful and relaxing feeling of staying in the countryside. Hotel rooms are usually distributed in small buildings and have a beautiful gardens. Also offers a full range of entertainment, including discos, theaters, shops and sporting activities which are often included in all inclusive. Still growing resort offers a large selection of rooms and suites, including: family rooms, honeymoon suites, rooms with Jacuzzi, eco-resort, etc. All Inclusive resort is situated right on the white sandy Bávaro beach, approximately 30 minutes from the International Airport of Punta Cana. 450 rooms in 10 low-rise buildings in a tropical garden and 24 Junior Suite with private Jacuzzi. All rooms are equipped with air conditioning, telephone, satellite TV, refrigerator, hairdryer, safe (extra charge), bathroom with toilet, terrace overlooking the garde nor sea. Baby cot on request free of charge. 4 restaurants: La Noray buffet restaurant (breakfast, lunch, dinner), beach snack bar El Cabo (10:00 - 17:00) and four a la carte restaurant, gourmet restaurant El Almirante, Italian restaurant, Mexican restaurant and Creperie. A la carte restaurants require reservations in advance and formal wear. 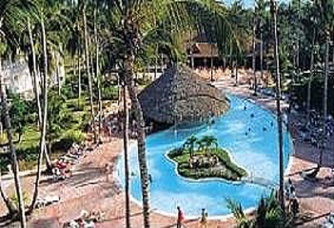 5 bars: El Balandro at lobby, El Ancla by the pool at El Catalejo by the Jacuzzi, bar El Cabo and La cubierta in the theater. Meals and snacks throughout the day, soft and alcoholic drinks till 23:00 of local production, animation program for children and adults throughout the day, evening entertainment and shows, entry to disco, 2 swimming pools for adults with children's paddling pool, Jacuzzi, children's playground, fitness center, playground, 2 tennis courts, dance classes, aerobics, beach volleyball, basketball, football, mini golf, ping-pong, table football, darts, non-motorized water sports (snorkeling, windsurfing, sailing, kayaks, etc. ), diving lessons in the pool, deck chairs, umbrellas and towels by the pool and the beach. Foreign alcoholic beverages and branded wines, drink at the disco, safe in the room for about 2 - USD / day, room service, beauty salon and massage, laundry room, motorized water sports, diving and fishing, horseback riding, babysitting, telephone, fax and Internet, medical care. parking, non-stop money exchange, car rental, 18-hole golf course, a typical Caribbean village of El Cortecito with many shops (souvenirs, supermarkets, boutiques, pharmacy, restaurants and bars, an art gallery). Are accepted by all common types of payment cards. Check-in is 15.00 and check-out is 13.00.